Sweat is condensing on your brow; the ticking of the clock is pounding in your ear. You stare owl-eyed as you painstakingly pull out a block by the millimeter. To no avail, the entire tower crumbles in front of you and cheers erupt from the competition. Dang it! On the surface level, Jenga is a game that involves a tower of rectangular blocks – not so much universal languages. But what about the sense of competition? Your racing heart? The excitement? The worries about making the tower topple? Although not everyone has played Jenga, we can all relate to some aspect or another of the game. So what happens when I relate Jenga to marriage? Here is a short reflection I wrote after hearing this podcast about the power of movie-watching in reducing divorce rates on Scientific American. Marriage is a part of life that I dare not think about in the present. It is something that is so far off in the future yet feels so close. There are times where I worry about whether I will find “the one” and whether we will live until we are ninety, with nothing but gray hair, a life of happiness, and noisy (but precious) grandchildren. And they have reason to, I guess. With commitment, love, and longevity undoubtedly comes differences in opinion, bickering, and nonsensical anger. Marriage is not perfect – neither are humans. It is a roller coaster ride of bountiful memories and bitter arguments. Although it is – and has always been – a dream of mine to meet the perfect guy in medical school and live happily ever after, I am aware that many couples unfortunately are not able to achieve such a dream. Divorce or separation may be due to a number of reasons: immaturity, lack of preparation, loss of affection due to careers or long distances, so-called irreconcilable differences, among others. But what exactly leads a couple to sign the dreaded papers? How many failed marriages have or had the potential to be rescued from the stormy waters before they sink to the bottom? Is spending more time with each other really the answer? Information from the podcast suggests that watching romance movies and talking about them afterwards is a good way to help keep the lovey dovey feelings alive between two people in a relationship. Meaningful conversations that follow such movies should help the couple reflect on their own relationship by allowing them to compare it to that of the couple in the movie. The result, hopefully, is that they can determine which piece of the puzzle is out of place so that they can strengthen the weak points. But of course, there is much more to keeping a marriage together than watching movies. You don’t win Jenga by simply removing the blocks. Thought and care must be put in to pull the most suitable block, which then has to be placed at the very top of the tower. Marriage is just like this: you need to think about the shortcomings and differences and how you’re going to overcome them without destroying the relationship. Such shortcomings build on each other, which may lead to bumpy roads once in a while; but in the end, it is those beastly players who know how to manipulate the Jenga blocks who ultimately win the game. All in all, any activities that require quality time together at all is a good start, whether that is going on spontaneous road trips, quiet strolls on the pier, or even grocery shopping. Reminisce the pre-marriage days, recreate it as much as possible, and remember that effort is key. 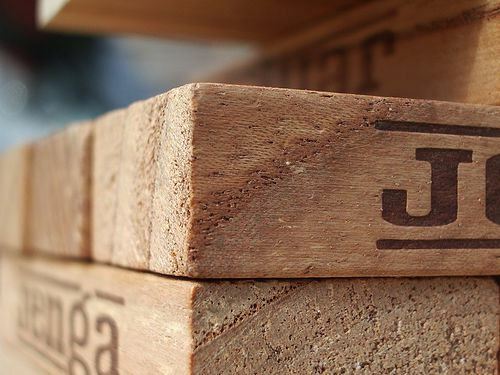 Be a boss at Jenga. This entry was posted in Can You Relate? and tagged be a boss, christinepham, divorce, excitement, games, gaming, human relationships, jenga, losers, marriage, podcasts, pounding hearts, romance movies, saving a relationship, scientific american, sweat, towers, watching movies, winners. Bookmark the permalink.